(TibetanReview.net, Apr07, 2017) – Gloating over its enormous economic and military superiority over India, China over Apr 5-6 threatened New Delhi with all sorts of severe retaliatory measures for having ‘invited’ Tibet’s exiled spiritual leader, the Dalai Lama, to visit Arunachal Pradesh, which it insists is “south Tibet of China”. The Tibetan leader is visiting the state over Apr 4-12 to give a series of religious teachings to its Buddhist followers. China’s Foreign Ministry Spokesperson Hua Chunying expressed firm opposition to the visit. She accused India of having disregarded China’s concerns and insisted on “inviting the Dalai Lama for activities in the disputed eastern section of the China-India boundary”. Hua claimed that the visit severely hurts China’s interests and the China-India relationship. Hua also reiterated that Tibet-related issues had a bearing on China’s core interests and demanded that the Indian side stop using the Dalai Lama to undermine China’s interests. 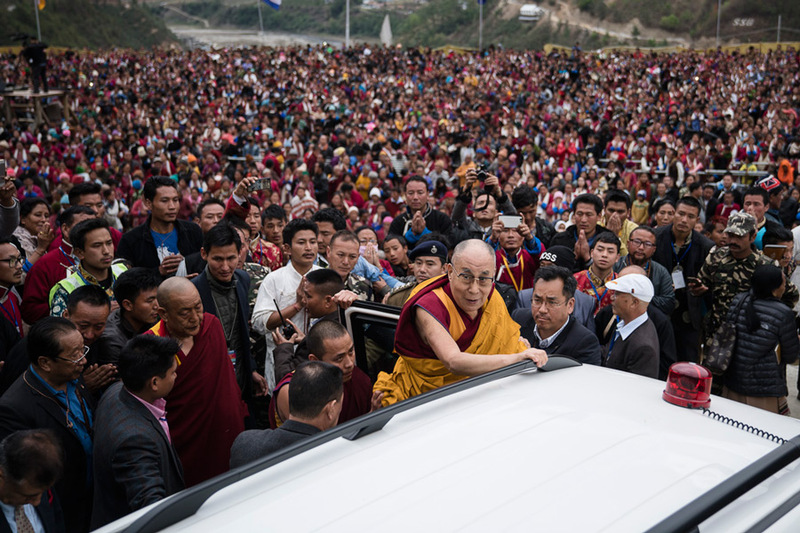 On Apr 5, the Chinese foreign ministry summoned Indian ambassador Vijay Gokhale to lodged an angry protest against the Dalai Lama’s visit to Tawang, reported timesofindia.indiatimes.com Apr 6. China’s official media has been much more shrill in their denunciation of the visit. An Op-Ed in China’s stridently nationalist party mouthpiece GlobalTimes.cn Apr 6 claimed that India had “long attempted to use the Dalai Lama as a card” and a tool to put pressure on China and derided it as a “clumsy and rude move”. Another OP-Ed in the same edition of globlaltimes.cn accused India of challenging Beijing’s bottom line, suggested that New Delhi may have underestimated Beijing’s determination to safeguard its core interests, and made it clear that China doesn’t allow India to free ride on its economic growth while jeopardizing Beijing’s core interests. Zhu Weiqun, the head of the Ethnic and Religious Affairs Committee of the National Committee of the Chinese People’s Political Consultative Conference, a rubber-stamp national political advisory body, has said India was “losing its dignity as a big power” by allowing the visit. The former deputy head of the top party body in charge of Tibet policy, the United Front Work Department, is known for his strident anti-minority and anti-religion stance and was, nevertheless, tasked with the now stalled talks with the Dalai Lama’s representatives. “India is losing its dignity as a big power by playing around with such a figure,” Zhu was quoted as having told the Global Times. The Dalai Lama has been invited to the state by its Chief Minister Pema Khandu and is being accompanied by India’s junior Home Minister Mr Kiren Rijiju who is an MP from the state. These seemingly official nature of the visit is said to be responsible for China’s greater show of anger at the Tibetan leader’s visit to the sate this time. Pema Khandu has trashed China’ territorial claim by saying the state’ historical border was with Tibet, not its occupying power China. And Rijiju has said “Arunachal Pradesh is an inseparable part of India”, that the visit was “purely religious” and that “China shouldn’t interfere in India’s internal matters” just as India does not in China’s. The Dalai Lama himself has said “India has never used me against China” while thanking the Indian Government for its hospitality. “I have been here since 1959. India has taken great care of me. I am their longest staying guest. I am thankful to them,” tribuneindia.com Apr 5 quoted him as saying.